iWindsurf Community :: View topic - Why are Sailworks Sails the Best Sails Ever ? Why are Sailworks Sails the Best Sails Ever ? My 5.5 Naish Sprint for example, it's monofilm. Takes an insane amount of downhaul and is lifeless unless overpowered. Not enough out haul and you cannot attach the boom..
Are you sure you are using the correct mast? Standing up with my left hand against the bottom of the extension I can pull the downhaul with my right hand & get the sail cleat to within 6 cm of the base extension. Then sit down & a quick tug completes the downhaul. My 5.5 Sprint is one of the few sails I own that I can downhaul without any tools or knots. My Sprint is far from lifeless & has great top speed. Oh please, Chris, you don't really think those guys choose their sails based on how they like them? They go for the money offered! Sailworks, being a smaller company, doesn't have the budget to support big PWA stars. Regarding the pilot being the deciding factor; Of course it is! Bjorn Dunkerbeck in his prime could have won on ANY brand of sail! This thread is about how much we Sailworks sailors love our sails. The OP said they were the 'best sails ever' meaning for him. I chose Sailworks because they feel better and work better, for me, than any brand I've tried, and I've tried quite a few. Heck, I was a NP ambassador for 6 years! There's lots of good sails out there, choose the one that works best for you, but whenever you get a chance, try someone else's sails, or you'll never know what you're missing. try someone else's sails, or you'll never know what you're missing. A local BOUGHT 3 or 4 brands of whole quivers one summer, including SW. He returned each, finally reverting to his original, other, brand for most of his sails. He kept the Hucker for his largest sail, and he doesn't even jump (it was developed from tack to tip for Dale's high altitude hijinks, at the expense of other performance factors). Like everything else, sail choice is all about preferences. And, no, it wasn't obvious at all to readers choosing brands that this thread was about what somebody likes or even that the OP had tried others. Heck, his first priority -- kharma, or "soul", or some such crystal blue persuasion -- didn't even surface until page 6. Naish doesn't even test his windsurfing gear. Look at the boards. I have a 104 2010 Global Freeride. Biggest POS I ever owned. Like sailing box. The fin position is directly under the back straps, the slightest rail pressure and you spin out. Won't point, squirrel dog off the wind. Got my new 5.5 Retro in blue and neon green. Stunning. Radiant tape arrays recall cues from the 1990s. It looks like it should rig on a 460. Great sail. I've raved about my favorite boards for decades and my favorite sails for 15 years now, but based on what they actually DO, not on their "soul". That's a big distinction, needing clarification, for folks shelling out big bucks for them. Yes, I enjoyed my own SW and the many I've tested, but none of those experiences persuaded me to switch to them. What factors most influenced you on the brand you picked? I said I agreed with 3 things you look for in a sail plus I'd add what I can get for it on the used market when I sell. I think I've read you like to cycle to a new quiver every year so you probably pick something that sells well in the Gorge. I like how solid Sailworks has made their sails. Every year they seem to tweak them to last even longer to the point I had 3 yrs on sails that still looked fairly new and I sail a lot. Buy the closeout for under $600, sail it two or three seasons then sell it in days online for $200... hard to beat. I was Gaastra Race, then Rushwind when BP went there and made a good, non racer but stable sail that I loved until it fell apart... then he started Sailworks and I sailed his SW race sails... until Naish invented the shaped camberless sails... 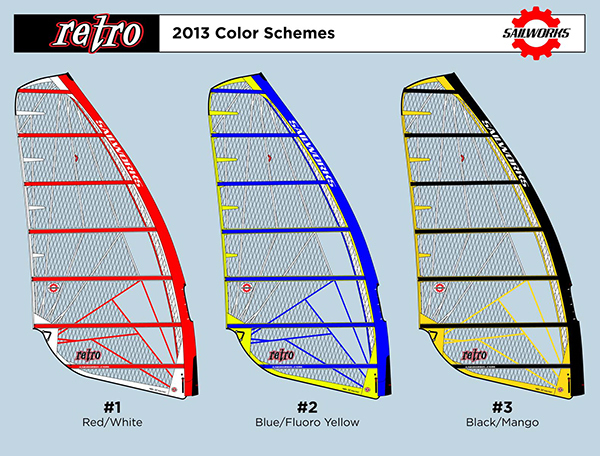 I switched to Naish Noas and sailed those until Sailworks made a more durable version, the Retro. This year, to replace stolen gear, I switched on 3 of my 4 sails to Hucker at the urging/suggestion of Bruce. I still use Retro for my smallest, the 4.5. Huckers definitely take more skill to sail but for over 200# sailors, they seem to have more range and are worth the extra attention I have to pay to get the extra performance. Every sail maker has sailors who sail their gear tons better than me with fewer years on the water so who knows what is best but I like to support a West Coast, US company that has great customer service and a great product. To spread it out some and to buy what would fit in my van etc, I bought a Maui Sails 9.0 Titan with their mast and boom... I like how their team rider, Micah Buzianis, helped me pick a board from JP in late 2012 even before I was interested in their sails and Phil McGain answers emails and facebook questions... I haven't sailed it yet, still waiting for a big board on order, but I've heard good stuff. Tunability, suitability and durability. Lot's of low end and massive stability on the edge of being OPd. Sheet hard going into a jibe and the sail dumps power, flip, pump and gone....... Fairly high downhaul is the key and they work well with SDM. Yet my 2008 Naish Pro 1111 Wave 80L is my one of my very favorite and most-trusted boards ... just shy of my Maui Project Waves -- when the Gorge goes crazy with huge gusts and DEEP lows. It has the volume to handle the lulls and yet has NEVER surprised or disappointed me when I was rigged way too big for the gusts and the terrain was big and harsh. My same-year, same-sized Starboard EVO stubbie tried to kill me in those conditions. Whether pinching hard to beat upwind at speed, blasting way off the wind for the sheer thrill of it, or constantly slamming back and forth between the two, that Naish reads my mind and anticipates my intentions like no other board I've ever sailed. Its fin is directly beneath my back footstrap, too -- giving me total, absolute, subconscious, effortless, heel'n'toe control over its every move with subtle twitches of that foot, deep in the strap until the shoreline or a whim says it's time to jibe. That may generate some kharma, or maybe even soul, but its the performance that leads to the latter, not vice versa, IMO. Subarude, try a swept back pointer. The reason the finbox is placed forward is for looseness and turning when used with a SWEPT BACK pointer fin.